Warwick, RI – It began as an idea - to preserve the memories and acknowledge the accomplishments of radio professionals who have touched the lives of so many in the Ocean State. The Rhode Island Radio Hall of Fame was established in 2008, with a goal to celebrate the now 87-year history of the industry in Rhode Island, and to honor the men and women who have played a part in its growth. 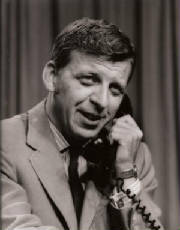 Jack Comley – with fellow Hall-of-Famer Sherm Strickhouser, Comley is considered a pioneer of the talk radio format in Rhode Island; well-read, informed and provided special attention to the “entertainment” value of radio during the ‘60’s and ‘70’s; avid sports fan that used his public forum to contribute to the construction of the Providence Civic Center. Comley passed away in 1974 at age 41. 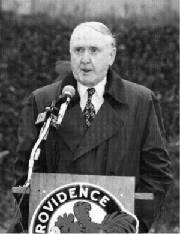 George Patrick Duffy – “Voice of the Rhode Island Reds” professional hockey team covering four decades, Duffy is still active as a coach at St. Raphael Academy today, at age 88. He has also been behind the microphone for numerous teams and games since the 1940’s, on WEAN, WJAR, WICE, WXTR, WPRO, WGNG and others. Carolyn Fox – brought “shock jock” radio into Rhode Island through stunts and promotions on the air; long time ratings leader at WHJY-FM, she also hosted on WPRO-AM and WWRX-FM in the ‘90’s. 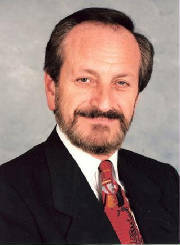 Daniel “Giovanni” Centofanti – a fixture at WPRO-FM since the 1970’s, “Gio” has hosted morning drive on 92 PRO-FM since ‘99; valuable production manager for current Citadel station cluster, as well as on-air host. Jimmy Gray – veteran radio personality dominating airwaves for WPRO-AM/FM, WCTK-FM, WHJJ-AM among others; quick wit and smooth delivery made him a favorite for listeners, and advertisers. Norm Jagolinzer – Norm is synonymous with “sentimental” and “nostalgic” radio in the Ocean State; distinct, smooth voice and delivery recognized by many through his work on WLKW; consistently at the top of charts in the ‘70’s and ‘80’s. Jim Mendes – Mendes was one of the key jazz DJs in the state during the '50s and '60s, spinning discs on WPAW-AM, WICE-AM and WJAR-AM. Of Cape Verdean descent, he was also one of the first broadcasters of color in the market. 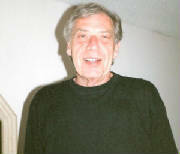 Mendes passed away at the age of 80 in 2006. 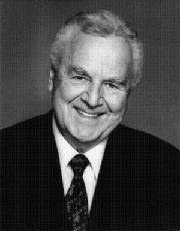 Don Pardo – long associated with his work on Saturday Night Live, Pardo began his storied career at WJAR-AM in 1938. 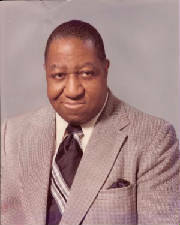 He joined NBC in 1944, remaining on the network staff for the next 60+ years. The original “voice” for The Price is Right and Jeopardy, Pardo still performs voice work for SNL today, at age 91. The official induction banquet for the Class of 2009 took place at the West Valley Inn in West Warwick, RI on Thursday, May 14th, 2009 at 7:00 pm, with a cocktail reception beginning at 6:00 pm. Proceeds from the event go to the children of A Wish Come True, Rhode Island’s oldest wish granting organization. As an added attraction to the Rhode Island Radio Hall of Fame, local radio fans are encouraged to participate as Associate Members, by contributing a one-time fee of $25. For their donation, fans will earn the right to nominate local radio industry professionals for future consideration in the Hall of Fame, receive a discount on induction ceremony dinner tickets, and receive a certificate of membership. 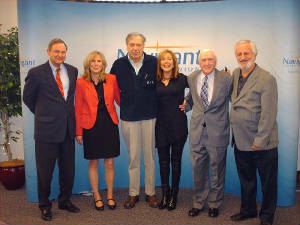 The $25 lifetime membership fee is tax deductible, and should be made payable to A Wish Come True, Inc.
Members of the Class of 2009 (pictured L to R): Heath Comley, Ann Noyes (Jack Comley's children), Jimmy Gray, Carolyn Fox, George Patrick Duffy, Norm Jagolinzer.